● TOKYO, March 12, 2019 ? 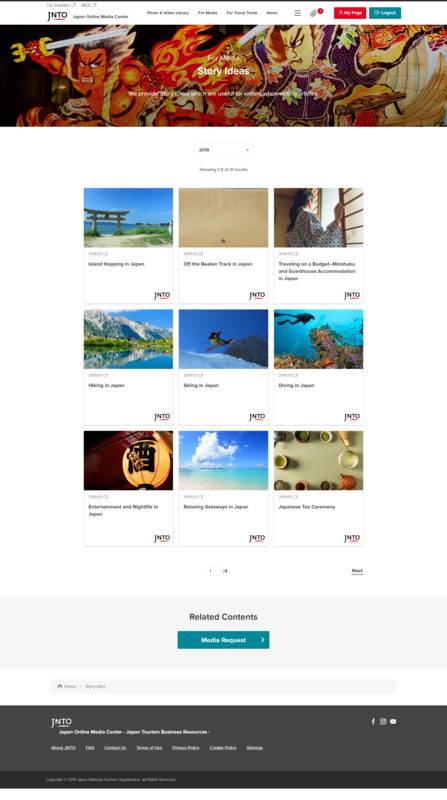 Japan National Tourism Organization (JNTO) has fully revamped an online media library called “Japan Online Media Center” (provided in English). ● In addition to 14,000 downloadable photos and footages, new JOMC also provide these assets packaged with text data to facilitate media articles and coverages. ● Contents have been expanded with useful and convenient tools for business partners such as tourism statistics, press releases, digital brochures, e-learning and land operator list. Japan National Tourism Organization (JNTO) has revamped online media library website “Japan Online Media Center (JOMC)” with enhanced features. As global attention to Japan continues to gain momentum towards Tokyo 2020 Olympic and Paralympic Games, JNTO launched JOMC in 2016 to provide a media archive with tourism photos and footage for overseas media publications, and to maximize exposures on Japan as a must-visit destination. JOMC users can now browse, download and edit free images and footages by simple registration. JOMC used to limit its users to overseas media only, however, JOMC is now open to domestic media, travel trade partners and government officials. JOMC free stock media library has increased from approximately 9,000 in 2016 to the current 14,000 materials. While former JOMC was a simple media library limited to browsing and downloading assets, new JOMC features convenient functions allowing users to select sizes for different purposes, to bulk download multiple assets, and to gather packaged image and video materials combined with text data, ready for use in media articles and movies. Other resources are also available on JOMC including tourism statistics, press releases, digital brochures, e-learning and land operator list. 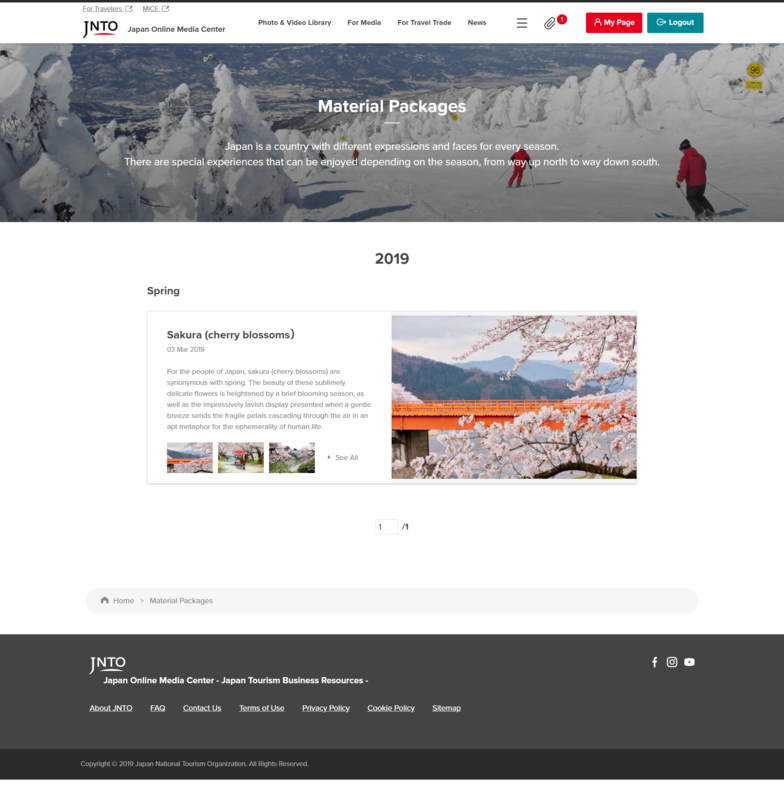 JNTO will continue to upgrade and expand JOMC contents to provide useful and convenient resources for business partners promoting Japan as a tourism destination. Users are required to register to download materials. Users from former JOMC are also required to re-register. This section consistently provides up-to-date story topics, including popular tourist destinations throughout Japan, travel experiences, and a guide series that explains everyday Japanese culture in an easily understandable manner for non-Japanese readers. In addition to sightseeing information, the content also highlights many authentic aspects of Japan that visitors can experience firsthand. This special content library is aimed at helping members of the media find materials on topics for coverage. Images and videos are carefully selected in line with seasonal topics and fresh themes, and prepackaged with text. e-learning websites provides travel agencies basics and expertise on Japan tourism to become a Japan sales specialist. 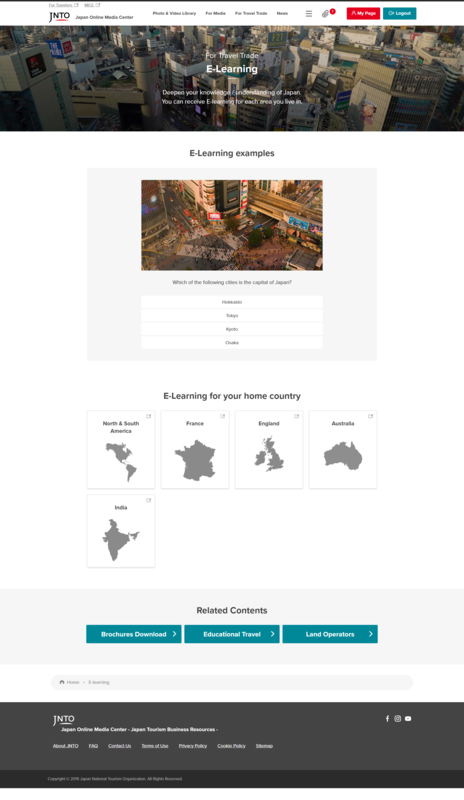 JOMC offers links to each country’s e-learning websites including US, France, the UK, Australia and India, along with sample questions that give an easy taste of the e-learning content.